The literal English translation of the title becomes: "Harry Potter and the Stone of the Ways", but you probably know it better as "Harry Potter and the Philosopher's Stone". It was translated by Klaus Fritz and the cover was illustrated by Sabine Wilharm. The cover is from the hardbook version. On the front is a large image of Harry with the gaint chess board Harry, Ron and Hermione have to play across. You can see Ron and Hermione amongst the pieces. On the back is an owl, that looks slightly snowy so may be Hedgwig and he's carrying a letter in his beak. (The owl is also cleverly seeming to carry the bar code). There is no image on the spine. Also note that the author's name reads "Joanne K. Rowling rather than "J.K. Rowling". It's rumoured Miss Rowling wanted the former version on all her books but was refused by the publishers as using initials is more suggestive of a male writer. 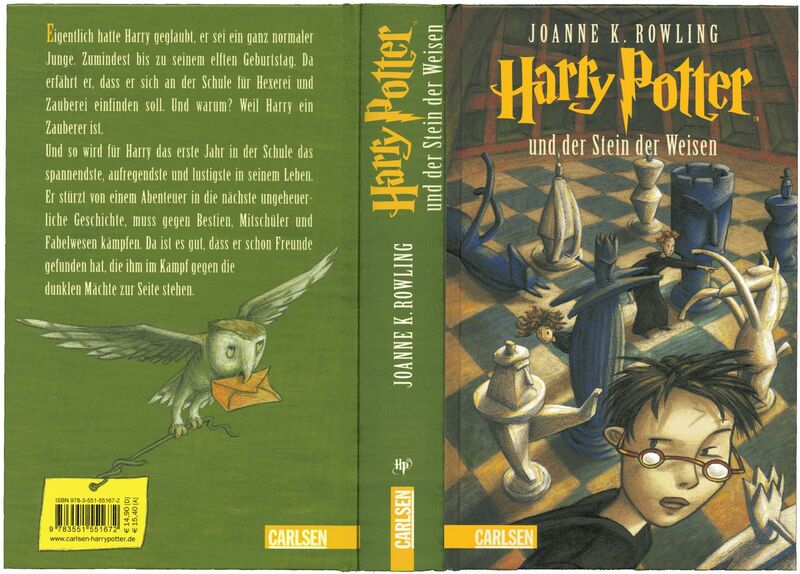 Harry Potter und der Stein der Weisen, translated by Klaus Fritz, illustrated by Sabine Wilharm. Check out the Top 200 books. My bookshop for some great buys.